If you want to become a digital shutterbug, the place to start is by reading this excellent introduction which tries to explain everything in plain, non-technical terms. In the matter of a relatively few years, photography has rapidly moved from being film-based to digital. Along the way, snapping pictures has been transformed. You now have an incredible array of cameras to choose from and the question is what are the differences? Which is the best camera for your needs? This book will help you decide. First, it will review some of the features to look out for in the group of less expensive point and shoot cameras. Then, it will take you on a tour of interchangeable lens cameras and it will explain some of their superior qualities. It will point out the differences between "mirrorless" cameras and the reflex cameras which use a mirror and prism system so that you can look through the lens and see exactly what you are taking. You will then be taken inside of the "digital darkroom" where software programs have replaced trays of chemicals as a means of developing, altering and touching up your photos. Alternatively, you no longer have to rely on a photography store to "develop" your photos or enlarge them since you can now do all of this yourself, sitting in front of your computer with the appropriate colour printer. Now, if this prospect terrifies you, this book will help by explaining what different software programs can do for you. If you are looking to earn money by taking pictures, there is a chapter devoted to setting up a studio; the equipment you’ll need and how to make money from your investment. You will learn a bit about wedding photography, taking product shots, repairing damaged pictures, news and sports photography as well as selling your pictures to stock photography agents. If you want to share your photos with friends, family or the whole world, you will learn about some of the photo repository sites that have sprung up in recent years and what they can do for you. Take a look at three software programs which will help you store and organize your collection. Then find out where you can obtain more information to help you enjoy and profit from your photos. 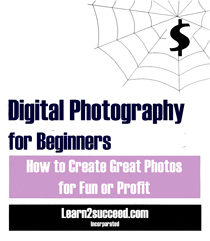 In short, this book opens the door on how to become a digital shutterbug without having any prior knowledge about digital photography. Enjoy! Introduction: We've Come a Long Way! Chapter 4: Welcome to the Digital "Darkroom"
Digital Photography for Beginners: How to Create Great Photos for Fun or Profit by: Learn2succeed.com Incorporated: Softcover; 98 pages; ISBN: 978-1-55270-447-9 published in 2012; $17.99.